Keep wildlife safe. 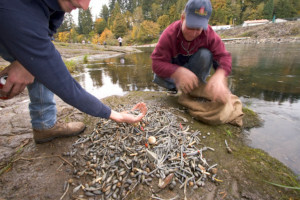 Please properly dispose of your fishing lines, hooks, food or beverage containers and litter. "Every litter bit hurts." Broken glass. Fishing lines. Hooks. Trash. All can easily injure swans and other wildlife. Please pick up and properly dispose of your trash and recreation gear. Keep wildlife safe. Photographs by Linda Claerhout, Jim Brandenberg, Margaret Smith, Three Rivers Park District. My Swan Story - by Linda C.
"Tonight this cygnet was discovered wrapped in fishing line near the shore by two men along the Hudson shoreline. When my husband and I and our dog arrived to do our nightly walk we saw them and several people standing around the swan, which was still breathing, tho' shallow. It was unable to even hold its head up. We suspected this swan was one we had been watching earlier that was ailing but we had difficulty finding lately. The swan passed away only minutes after we arrived at the scene. One of the men who brought it to shore and untangled the fishing line had two children, a young daughter and son. The young boy asked me if I knew how old the swan was and I told him it was a young cygnet, perhaps almost a year old since it still had a gray neck. Unknown to me the young girl was writing something on her paper pad while we talked about what to do knowing it could not be left there for scavengers, because in likelihood it has been ill with lead/ other issues, unable to fly for some time. We had been looking for the sick swan each day but had not seen it. Sadly it must've been caught in the fishing line today sometime, where it was found. I noticed a piece of paper lying beside it. I bent down and saw that the young girl had written a R.I.P note for the swan. 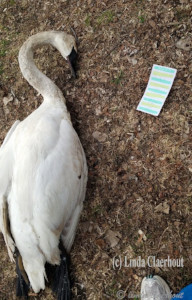 She wished for the note to be with the swan and had laid it next to it. The note read: 'R.I. P. cute trumpeter swan. 2017-2018. It died because of fishing line!' [a crying face emoji was at the bottom of her note]. Above: Lead poisoned adult swan at the far right at the snow bank. Note its drooping wings and isolation, compared to healthy swans on left. Here's "The rest of the story." Within a minute of the photo being taken, the sick swan was unable to hold its head up. Its head fell face first into the snowbank. It struggled to lift its head out of the snow, then curled its head and neck onto its body. It died later that day. Thanks to your support, we continue our decades long work on swan health issues. Two major sources of swan deaths are powerline collisions, and lead poisoning through ingestion of lead ammunition and lead fishing tackle. 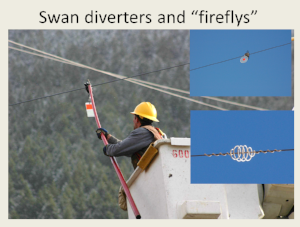 We work with utility companies to safeguard swan flights over power and transmission lines, by advocating "marking" the lines with diverters. Diverters help birds see powerlines sooner and avoid collisions. We also advocate to keep transmission lines from crossing important bird migratory corridors. If you need assistance working with your local utility company to mark powerlines where swan deaths occur, please contact us. For decades we have been working on swan mortality issues in the Pacific northwest, notably Washington and British Columbia. In the winter of 2018-19, just over 80% of swan deaths in an eight-county northwest region are suspected to be from lead poisoning and powerline collisions. One particular swan health project is Judson Lake which straddles the border of Washington and British Columbia. It is an important wintering site for many Pacific Coast Population swans. Judson Lake has a known lead "hot zone" that has been responsible for hundreds of swan deaths. 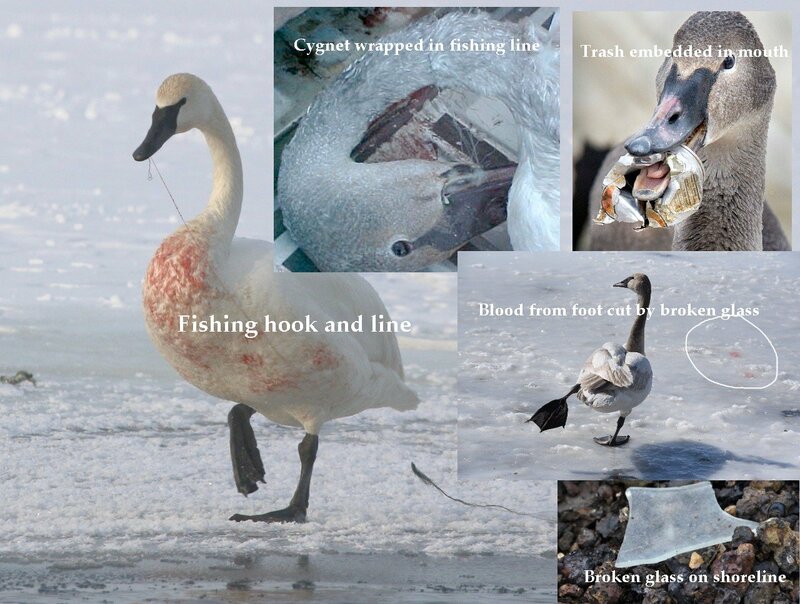 We have worked for many years with Washington Department of Fish and Wildlife, University of Washington, the United States Fish and Wildlife Service, and the Canadian Wildlife Service to reduce swan deaths there through an exclusion zone in the lake combined with other methods; analyze and diagnose the suspected causes of swan deaths in the region; and educate the public about switching to non lead ammunition. We work across North America on swan health issues, especially lead poisoning and powerline collisions. Our efforts include public education, presentations, working with partners to raise awareness about swan and waterfowl health issues, and much more. Learn more about lead poisoning. Be informed. Spread the word to keep wildlife safe. This article, written by Margaret Smith, TTSS Executive Director, was written for a sporting magazine. It explains symptoms you may see is a lead-poisoned swan. Management Strategies Lead Toxicity: A Threat to Wildlife. If you or someone you know hunts or fish, please switch to non lead products. Your donation to Adopt A Swan, and Lead Poisoning-Get the Lead Out will be used to to protect swan health. Keep wildlife safe. Switch to non toxic fishing tackle. 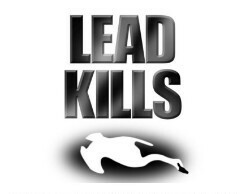 Keep lead out of our waterways. Do you fish or know someone who does? Get your FREE list of online nontoxic fishing tackle suppliers. Just complete the form below and download the list so you can keep wildlife safe TODAY.